Pinball demonstrates a clear separation between the user interface, which may be easily replaced, and the internal logic encapsulated in an SCXML file, which could also be used with another user interface. The Pinball example mimics a pinball game. The targets on the pinball table are substituted by GUI controls, mainly by push buttons. Display elements, including current score, highscore, and targets' lights, are substituted by labels. Usually, the state of the targets' lights changes very often during a game: the lights get turned on or off permanently or they blink at varying speed indicating a game (or a certain target) entered a temporary state. The state of each target light is presented as an enabled or a disabled label. There is no real ball, but clicking a target's button represents hitting a real pinball target with a ball. Initially and when the game ends, the pinball table enters offState. In that state, all lights on the table blink slowly (at intervals of 1 second). After clicking the START button, the pinball table enters onState. All lights are turned off and the pinball table is ready to be played. When the table is in onState and the players click the BALL OUT button, the game ends and enters offState. If the players' score is higher than the current highscore, the highscore is updated. The goal is to collect the JACKPOT. In order to do that, the players must hit all five CRAZY letters twice. They have unlimited time for hitting them for the first time. However, after they have collected all the letters for the first time, they enter the hurryState and must collect them again within 5 seconds. 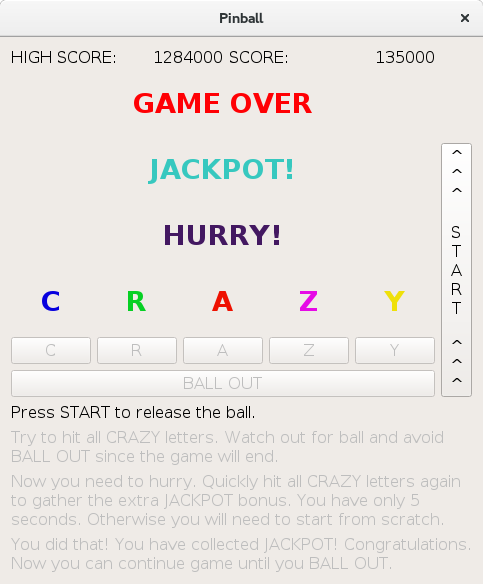 If the time has passed and the letters were not collected again, the players must start collecting the letters from scratch. 1.000 per letter hit when not in hurryState. 10.000 per letter hit when in hurryState. 100.000 bonus for all 5 letters when not in hurryState. 1.000.000 bonus for all 5 letters when in hurryState (JACKPOT). When not in hurryState, the letters already hit should blink at intermediate speed (500ms). Letters not hit yet should stay off. When in hurryState, the letters already hit should stay on. Letters not hit yet should blink fast (200ms). In addition, the HURRY light should blink at the same speed. When the jackpot gets collected, the JACKPOT light should stay on. We define a root parallel state "global", with two child states, guiControl and internalState, which are also parallel. Because the top global state is parallel, all of its direct children are active when it is active. In this example, the role of global is to collect the child states and make them both active at a time. The guiControl element is responsible for maintaining the current state of each light control that is visible on the pinball table. Each light has a corresponding state. As mentioned before, the guiControl state is always active, and since it is of parallel type, all its direct children are always active too. Therefore, the cLight state is always active. However, only one of its children, cLightOn or cLightOff, is active at a time. The same applies to the other children of the guiControl state. In addition, we define transitions between on and off substates. For example, whenever the active state is cLightOn and a turnOffC event is received, we change the active substate of cLight to cLightOff. Whenever the active state is cLightOff and we receive a turnOnC event, we change the active substate of cLight to cLightOn. In our application, we use instances of QLabel class in C++ to represent real lights on the table. When the light transitions into the on or off state, we enable or disable the particular label accordingly. The connection between the state machine and the GUI part of the application will be shown in the C++ code later on. 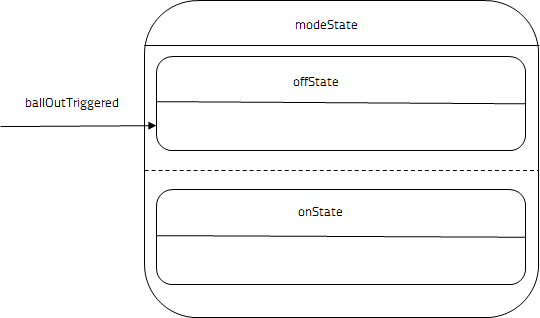 For now, it is enough to realize that changes to active states inside the state machine will serve as the external interface of the state machine that the other parts of the application (such as the GUI part) can listen to. All of the mentioned events that switch the state of a light will be generated by this state machine inside the internalState in reaction to running timers or external triggers. 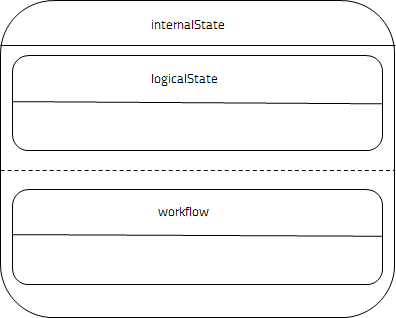 The internalState state consists of two main parts: logicalState and workflow. The logicalState state holds the definitions for the modes that the game is able to go into and for the logical states of collected targets. The workflow state implements a generator for light blinking and calculates most of the new states the machine should go into depending on incoming events and on currently active states. As mentioned already, internalState is always active, and since it is of a parallel type, logicalState and workflow are always active too. The logicalState state consist of two parts: letterState and modeState. The lettersState state maintains the logical state of the buttons pretending to be targets that were clicked by the players. The letter state for the letter C holds whether the target for the letter C was hit, while the light state for the letter C holds whether the light for the target for the letter C should be currently on or off. In a real pinball game, these states are usually orthogonal, which means that if you have not hit a target yet, the target is blinking, indicating that it is currently worth hitting. This blinking means that the light state switches between on and off at short intervals, while the target state is continouosly off, because it has not been hit yet. The author of a pinball table can decide that after a target is hit (that is, after the target state switches to on) the target's light is continuously turned off or on or the intervals between lights blinking become shorter or longer. As mentioned before, letterState is always active, which means that its only child lettersState should always be active too. However, there is one exception: for a short while the lettersState may end up being not active. This happens when the transition for lettersState is being performed. This transition is triggered when the resetLetters event occurs, and it instructs the state machine to exit lettersState and all its descendant states and reenter lettersState and set up all its descendant states with their initial states. In short, the resetLetters event resets the lettersState and all its descendant states to the default configuration. The lettersState contains five direct substates that correspond to five different letters. The content for other letters' states than C is not shown here, but it is analogous to the content for C's state. The letter.C state contains two substates reflecting its off and on states: cLetterOff and cLetterOn. The letter.C state inside its parallel parent lettersState is always active (under the condition that lettersState is active, as described before). However, only one of its child states is active at a time: cLetterOff or cLetterOn. The initial substate of the letter.C state is cLetterOff meaning that whenever the letter.C state is being activated (which happens initially and after the resetLetters event) its active substate will be set to cLetterOff. The cLetterOff state defines a transition, which will be triggered by the cLetterTriggered event. This transition activates cLetterOn, the other child of letter.C, only when the machine is in onState (that is, when the pinball game is running). 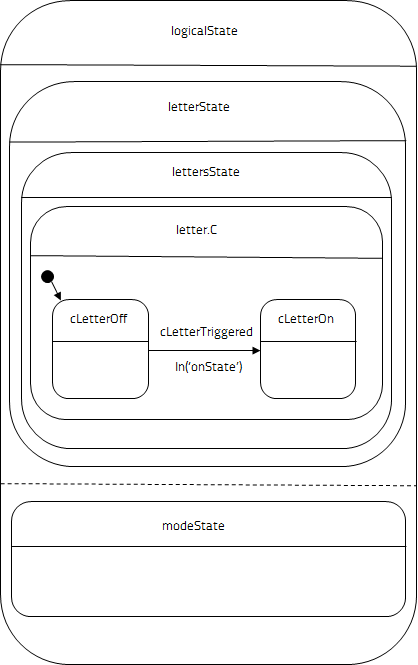 The cLetterTriggered event is expected to be an event posted into the state machine from outside of the state machine. This event should be generated when the ball hits the letter C target. In our example we mimic it by the clicking the letter C button. The cLetterOn state is defined as a final state, which means that whenever this state is activated the done.state.letter.C event will be automatically posted by the state machine. This event will be used later for updating the current score. Moreover, when all lettersState children reach their final state, the state machine will automatically post the done.state.lettersState event. This event will be used later, too, for updating the current score and for turning on or off the hurry state. The modeState state consists of two substates, offState and onState. The offState state describes what should happen before the pinball game is started and when it is over, while onState represents the logic appropriate for the active game. When the pinball application starts or a game ends, the machine goes into offState. Entering that state invokes some actions, which are enclosed inside an <onentry> element. First, we update the highScore variable in case the current highScore value is less than current score value. This is being checked inside the "cond" attribute of the <if> element (note that we need to escape the "<" character with "&lt;"). Even in the off state, we want to show the last reached score, so we do not clear it here; we will do that when we enter the on state. Next, we raise two events: resetLetters to logically reset all letters that might have been hit during the last game and update to immediately activate the blinking and updating of all lights. When the machine is in offState, it is ready to transition into the onState if only the startTriggered event occurs, which is described by the <transition> element. This event is expected to be generated externally after clicking the START button on the pinball table. When the state machine enters onState, it first clears the current score variable. The onState state is of the parallel type and has two direct child states: hurryState and jackpotState. They are active as long as their parent, onState, is active. Both hurryState and jackpotState contain two substates that reflect their off and on states. Only one substate of hurryState and one substate of jackpotState can be active at a time. Initially, the off substates are active. Whenever we enter hurryStateOff or hurryStateOn, we generate the same two events we generate when entering the onState state: resetLetters and update. In addition, when we enter the hurryStateOn state, we send a delayed event, goToHurryOff, with a delay of five seconds, marked with hurryId. This means that after five seconds we just switch the state back to hurryStateOff without granting the bonus points. In this way, we implement the five-second hurry feature of the pinball table. We also define transitions from hurryStateOff to hurryStateOn when the goToHurryOn event occurs and from hurryStateOn to hurryStateOff when the goToHurryOff event occurs. When we exit the hurryStateOn state, we cancel the possibly pending delayed event that was marked with hurryId. This is important in case the five secons have not elapsed yet, but players have collected all the five letters in the hurry state. We then collect the jackpot and want the pending timer to finish. The substates of jackpotState generate the request to update the state of lights. The jackpotStateOff state defines the transition to jackpotStateOn when the goForJackpot event occurs. The opposite transition is not needed, because when the jackpot gets collected, the corresponding light remains lit until the end of game. When a new game starts, the jackpotState is entered again which causes its initial active substate to be jackpotStateOff. In addition, the onState state defines one transition in reaction to the ballOutTriggered event which instructs the machine to go into the offState. The ballOutTriggered event is expected to be an event posted into the state machine from outside of the state machine. This event should be generated when the ball gets out of playing area of the table. In our example we mimic it by the clicking BALL OUT button. Posting the event from outside of state machine will be shown in the C++ code later on. 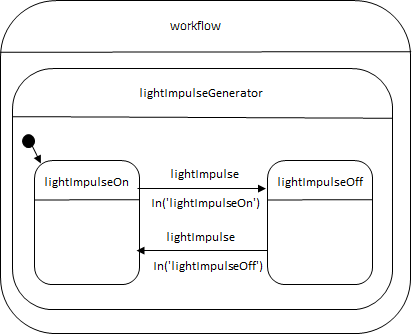 The workflow state is responsible for generating the blinking lights. The generator is defined in its lightImpulseGenerator substate. In addition, it is responsible for reacting to events that have been posted so far from the other parts of the state machine. The lightImpulseGenerator contains two child states: lightImpulseOn and lightImpulseOff, with only one active at a time. Whenever the delayed lightImpulse event is being delivered, it immediately causes the transition from lightImpluseOn into lightImpulseOff or vice versa, depending on the state the machine was in. In effect, the lightImpulseGenerator toggles between its on and off state. These transitions are defined inside lightImpulseGenerator, so it means that during this toggling the machine also exits lightImpulseGenerator and reenters it immediately afterwards. Entering lightImpulseGenerator causes the generation of the update event. The update event triggers a targetless transition and posts two other events: scheduleNewImpulse and updateLights. The first one, scheduleNewImpulse, returns back to the lightImpulseGenerator, which posts a delayed lightImpulse event. After the delay, the lightImpulse event gets delivered back to lightImpulseGenerator, which causes it to toggle its substate again. In this way, the machine enters into a cycle. The current delay of the lightImpulse event depends on the state in which the machine was in the time of posting the delayed event. If a scheduleNewImpulse event occurs on demand, before the next delayed lightImpulse event gets delivered, we cancel any possible pending events. Whenever we receive the event the name of which matches the done.state.letter. *, we update the current score. When the machine enters the final substate of the letter.C, it emits the done.state.letter.C event. The same happens for all other letters we have previously defined. We capture the events for all letters, that is why we have used an asterisk after a dot in the event name. The transition above is targetless, since we just listen for matching events and update the internal data accordingly without changing any active state. The new score is being increased by 1.000 or 10.000 points, depending on whether we currently are in hurryStateOff or hurryStateOn. After the score is updated, we generate the updateLights event in order to immediately update the letters' lights accordingly. We do not generate the update event here, since we do not want to toggle the light impulse now, but just update the lights according to the current impulse state. We also intercept the done.state.lettersState event, which is being generated when all the letters have been hit. Depending on which state we are currently in, we grant the players either a small bonus of 100.000 or a big one of 1.000.000 (jackpot). In addition, we toggle the hurryState substate by sending the goToHurryOn or goToHurryOff event. When all letters have been collected while in hurryStateOn, we also raise the goForJackpot event which instructs the machine to activate the jackpotStateOn. When we receive the updateLights event, we first want to send a updateScore signal outside of the state machine. We pass the current values of the highScore and score variables to the signal. This signal is received by the C++ part. Next, depending on whether we are in jackpotStateOn or jackpotStateOff, we send the turnOnJackpot or the turnOffJackpot signal, which instructs the guiControl state to transition to jackpotLightOn or jackpotLightOff, respectively. When the machine is in idle state, (that is, in the off state) or when the game is on, but no interaction occurs, the updateLights event is delivered periodically during the game, each time with the lightImpulseOn or lightImpulseOff state toggled. Depending on the current state of the light impulse and on the active state (offState, hurryStateOff or hurryStateOn), we turn on or off all the lights according to the description of the pinball table. The GUI part of the application consists of a mainwindow.ui file which describes the static user interface of the game. The C++ part of the application consists of a MainWindow class which glues the GUI part with the SCXML part. The class is declared in mainwindow.h. The MainWindow class holds the pointer to the Pinball *m_machine which is the state machine class automatically generated by Qt out of SCMXL file and the pointer to the Ui::MainWindow *m_ui which describes the GUI part. It also declares two helper methods. The constructor of the MainWindow class instantiates the GUI part of the application and stores the pointer to the passed Pinball state machine. It also initializes the GUI part and glues the GUI part to the state machine by connecting their communication interfaces together. The initAndConnect() method connects the state with the corresponding GUI widget by binding its activity with the enabling of the widget, so that whenever the state is active, its corresponding widget is enabled and whenever the state is inactive, the widget is disabled. We do that for all lights, targets, and description labels. We also connect to the eventOccurred() signal, propagated by the state machine and intercept the updateScore event sent from the SCXML document in order to update the score displays with the values passed with the event. The info about hitting any GUI target needs to be passed to the state machine and we do that by connecting all target buttons' clicked signals to the lambda expressions which submit the corresponding event into the state machine. In the main() function in the main.cpp file, we instantiate the app application object, Pinball state machine, and MainWindow GUI class. We initialize and start the state machine, show the main window, and execute the application.